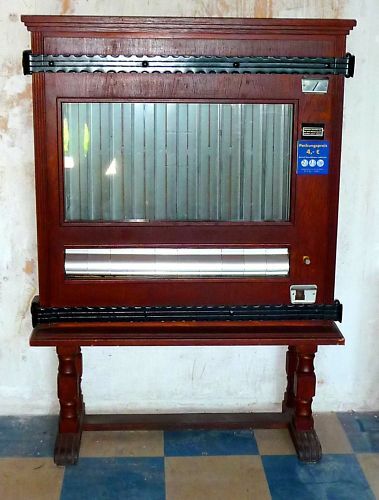 Finally I found one of these old cigarette machine (here one from the 1970ies) which will be integrated in the mail art exhibition as an ARTOMAT. I will pick them on thuesday and hopefully it will work fine. I hope I can find some artists who will participate in this interactive project, you can send your multiples in (at least 10) for this ARTOMAT, it must be fit inside a cigarette box. (size ca. 86 x 55 x 22 mm) - your art work can be related to Bismarck (this would be fine) but not necessarily. Each multiple should be signed and addressed, so maybe the buyer could get in contact with you. Each participant of this ARTOMAT project will get a free copy of the mail art catalogue which will be published in May. Yes, I finally got the fundraising for it - that's the good news for easter. Please get in contact with me, if you are interested.